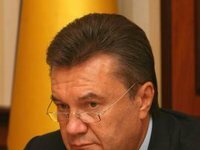 Ukrainian President Viktor Yanukovych believes the opposition's protests on Independence Square in Kyiv in support of closer integration with the European Union, known widely as Euromaidan, are a sign of the people's desire to live better. "When we saw such an upsurge in society and when we saw Euromaidan, I said at the very start that there is nothing bad in this. This is the people's aspiration for a better life," the Ukrainian presidential press service quoted Yanukovych as saying at a meeting with candidates for heads of district administrations on Tuesday. Yanukovych noted at the same time that "a lot of people are guided not by reason but by emotions." "Politicians, extremists, and various instigators started to gamble on this during this emotional outburst. We need to make conclusions from this all, and we are making them so as never to allow such cases in the near future. The Lord has given us this ordeal, and we should pass it with an open face and looking into the people's eyes," he said.